All books reviewed by Toothfairy Island have something to do with the toothfairy or oral and full body health. Emphasis is placed on educational content, pure beauty, fun stories and child friendliness. Dave and the Tooth Fairy is a beautiful book with a very engaging story. The illustrations are photo realistic and absolutely beautiful. 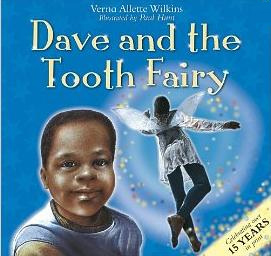 Dave is a young African American little boy who has lost his tooth and can not find it. What can he do? He has looked everywhere, and without it he won’t get his money from the toothfairy so he can buy his kite. When his grandpa comes to visit Dave gets an idea. That night Afiya, his beautiful modern toothfairy, has heard the call to come collect his tooth, but she is puzzled by what she finds and leaves to get more money. Meanwhile in the middle of the night, Grandpa accidentally finds the tooth. When Afiya returns to Dave’s house she finds something even more puzzling. You will have to read the story to find out the answers to the mystery! In the end both Afiya and Dave have their dreams come true. We feel this book will become a family favorite for children, parents and grandparents.